Since The Smithereens burst onto the scene back in 1980, the state has produced some of the finest power pop in the history of the genre. 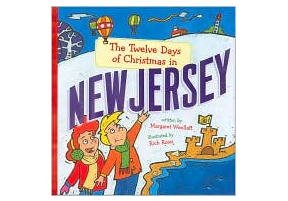 But like all places, New Jersey has had its ups and downs. The death of The Court Tavern and Maxwells had many of us thinking that things were changing for the worse. With Somerdale Maggie Says it Again, Marty Scott and his JEM label have given us something to smile about. Scott has focused on signing the best the state has to offer including The Gripweeds, and The Anderson Council among others. 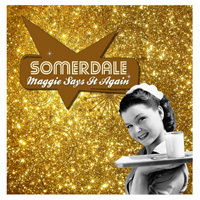 Somerdale’s Maggie Says It Again is an extended version of a previous release with added tracks and enhanced production. The soaring harmonies and 70’s vibe make the band’s sound immediately familiar although the influences aren’t obvious at first. While you’ll hear others mention Cheap Trick or Badfinger when discussing Somerdale, I hear as much of The Sweet or David Bowie in their sound. The title track is a case in point. The heavy bassline, killer melody and Bowie-like feel make “Shake It Maggie” one my favorites on the LP. It may be one of my favorites of the year. It is by no means the only highlight, however. “Take It From the Top” is as radio friendly as it gets. The following track, “Say It Again” is very nearly as catchy. That being said, “Feel the Magic” has all the charm of the best early to mid 70’s bubblegum tracks. Speaking of which, this one would have given The Sweet a run for their money. Guitars, hand claps and harmonies….damn this is good. And for added measure, there’s even a Christmas song at the end. Get the physical CD at Kool Kat Musik. Buy the mp3 version at Amazon.